This webpage lists some of the one-liners that we frequently use in metagenomic analyses. You can click on the following links to browse through different topics. You can copy/paste the commands as they are in your terminal screen, provided you follow the same naming conventions and folder structures as we have. We are sharing these codes with the intention that if they are useful and help you in your analyses, then we will be appropriately credited as considerable effort has been put into devising them. Here, we push each line to @a array, and then replace it with a slice of itself. We do @a = @a[@a-5..$#a], which means, replace @a with last 5 elements of @a. @a-5 is evaluated in scalar context here and it returns number of elements in the array minus 5. #$a is the last index in the @a array. In the first one-liner, use p(@a,@a,@a,@a) to generate tetra-mers. You can also give different length arrays instead of @a to p(). Last one-liner is bash-equivalent for comparative purposes. Say we have two FASTA files that contain some duplicate sequences (exact match) but with different IDs. This one-liner is useful for assembling paired-end reads for 16S rRNA amplicons where the primers are designed in such a manner that there is a substantial overlap between the paired-end reads. The above one-liner could be improved further. I am using a very high Gap Open Panelty which gives me only one local alignment and spans one alignment record in the output file generated by water. If I make it smaller, my regular expressions will fail as the alignments output by water will span multiple lines (later I'll update it). Moreover, I am not taking the consensus of the overlapped region, rather keeping the region from forward reads with the view that generally reverse reads have lower quality than the forward reads. It can be seen that my one-liner hasn't done a bad job. I am getting around 72% overlapped reads and out of which 99.53% are matching. pandaseq on the other hand is sensitive to the minimum overlap parameter. These taxonomic analysis software are frequently used in metagenomic analysis to generate taxonomic assignments for small-subunit ribosomal RNA (SSU rRNA) sequences. They rely on the lowest common ancestor (LCA) based taxonomic classification method by searching sequences against public databases, assigning them to the most similar taxa in a given taxonomy, and generating the abundance tables. 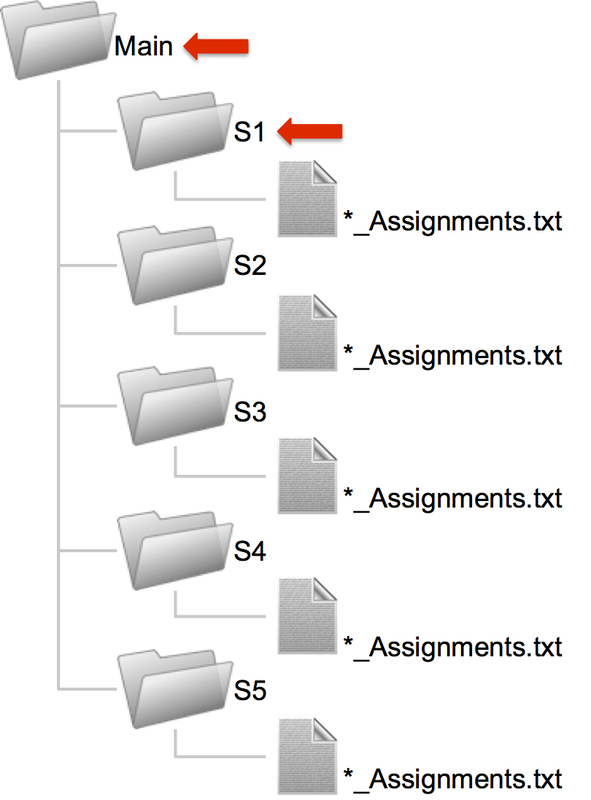 To extract an abundance table and the corresponding tree from CREST, the data should first be organized to follow the folder structure shown below. The above bash one-liner generates a test.csv file in each subfolder, which is then used in the second command to collate the results together to produce collated.csv. Step 2: Having generated the individual dat files (*_R1.dat and *_R2.dat), collate the forward reads and reverse reads separately to generate R1.dat and R2.dat, respectively. Step 4: Extract data for each flow cell in a separate folder and save it as space-separated (required by gnuplot) text file. This will create TXT files 1101.txt, 1102.txt, and so on. Note: I have used the above one-liners to assess the read qualities between two runs (Run1 and Run2) where flow cells of Run1 are less dense (roughly 1/7) than Run2, with total number of flow cells being 28. As a result of high density, I was getting fewer overlapping reads (assembled from forward and reverse reads) for Run2. 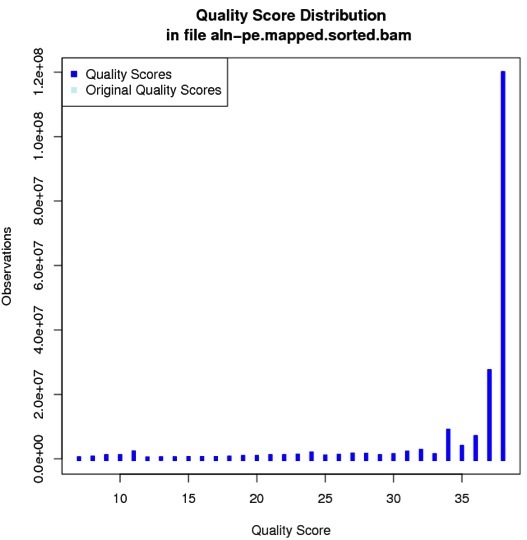 In the plots generated from Step 6, reads with lighter shades correspond to higher PHRED quality scores. 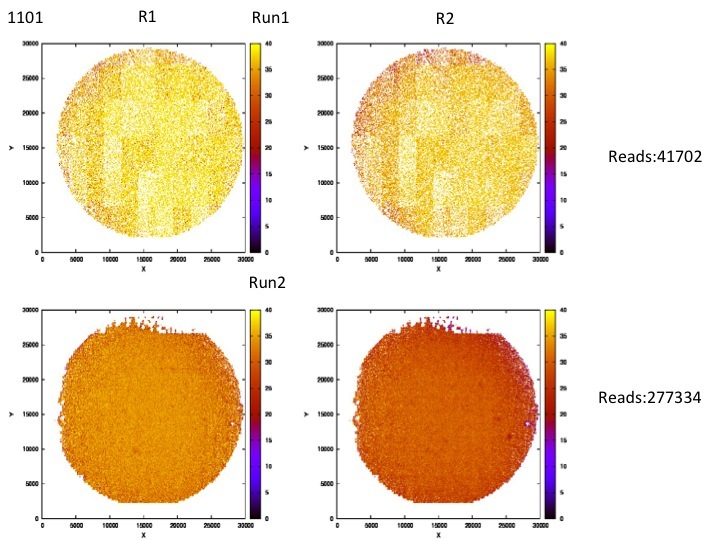 The following observations were then made from the results given below: in general, forward reads are better quality than reverse reads; noisy reads show some sort of spatial trend, i.e. 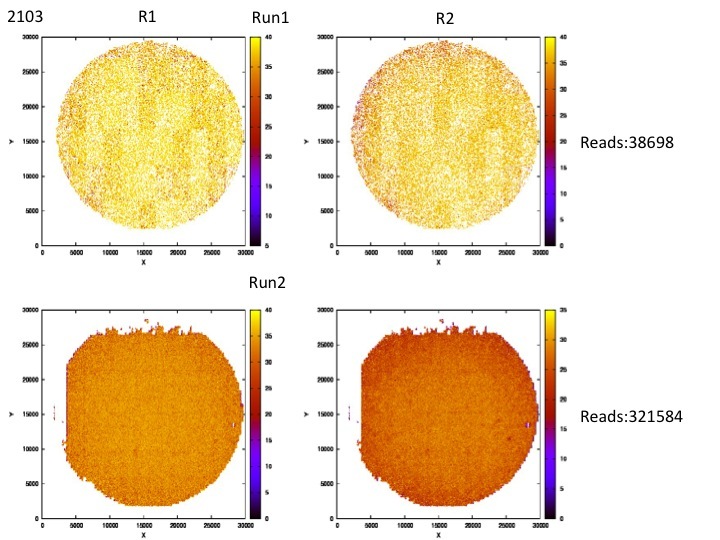 reads on the edges are more noisy; there is missing data around the edges and are those reads filtered out by QC of reads before processing; and there are rectangular patches that are more prominent for Run1. In some cases, the average read qualities in patches differ. Morever, in the plot for the flow cell 1114, Run2, one can notice a purple artifact in both forward and reverse reads. Similarly, for the flow cell 2114, reverse reads are worse than other flow cells. In the above one-liners, you can change $k to the number you want to downsample your reads to. Step 4: Extract only those sequences that were mapped against the reference database. Use -F 4 switch. Step 5: Generate a file length.genome that contains two entries per row, genome identifier and genome length. Step 6: Sort BAM file. Many of the downstream analysis programs that use BAM files actually require a sorted BAM file. -m specifies the maximum memory to use, and can be changed to fit your system. Step 8: Look at the first few entries in the file generated above. First column is genome identifier, second column is position on genome, third column is coverage. Step 9: Now we will count only those positions where we have >0 coverage. Step 11: We will now use the above file with lengths.genome to calculate the proportions using the following one-liner. It reads lengths.genome line by line, assigns the genome identifier to myArray and it's length to myArray. It then searches the identifier in aln-pe.mapped.bam.perbase.count, extracts the base count, and uses bc to calculate the proportion. Step 12: Some of the reference genomes were downloaded from NCBI. We will use a file IDs_metagenomes2.txt that contains the meaningful mapping from accession numbers to genome names. Step 13: Download my annotation script convIDs.pl and then use IDs_metagenomes2.txt to annotate column 1. Step 15: Now we will identify those genomes for which the proportions are less than 0.99. It is assumed that BWA, Samtools, Picard Tools, Interactive Genome Viewer, GATK, and VCFtools are installed and available in the system $PATH variable. I have a sample from Clostridium Difficile 630 from which I will summarize variants (SNPs). As can be seen, the error rates are quite low and we can proceed with the analysis. where -u tells samtools to output into an uncompressed bcf file, -D tells it to keep read depth for each sample, and -f specifies the reference genome file. Samtools calculate the genotype likelihoods and the bcftools does SNP calling based on those likelihoods. The -b flag in bcftools tells it to output to BCF format instead of VCF format, -c tells it to do SNP calling, -v tells it to only output potential variant sites, and -g tells it to call genotypes for each sample in addition to just calling SNPs. This line converts the binary BCF file into a text VCF file. We then pipe that into vcfutils.pl with the varFilter -D100 option, which filters out SNPs that had read depth higher than 100 (as sites with higher coverage than that represent variation between variable copy number repeats). Depending on the coverage you have in the dataset you can change this number, for example, you can use -D500. 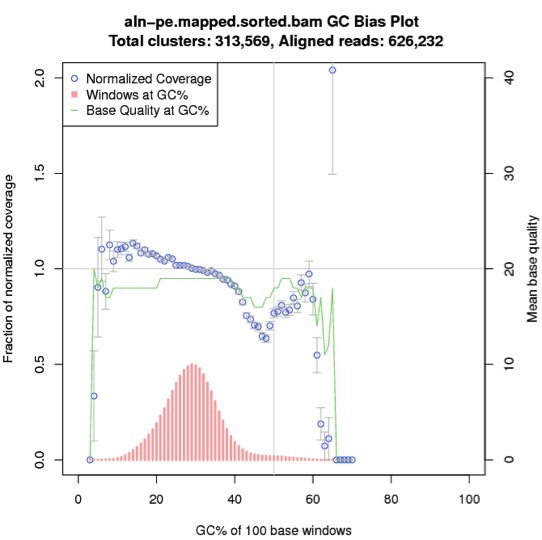 Samtools detect SNPs by checking number of different reads that share a mis-match from the reference, the sequence quality data, and the expected sequencing error rates at a given site. Now we display first few records of the VCF file. You can get more information on the format from here. The parameters are slightly different than those used in samtools mpileup. 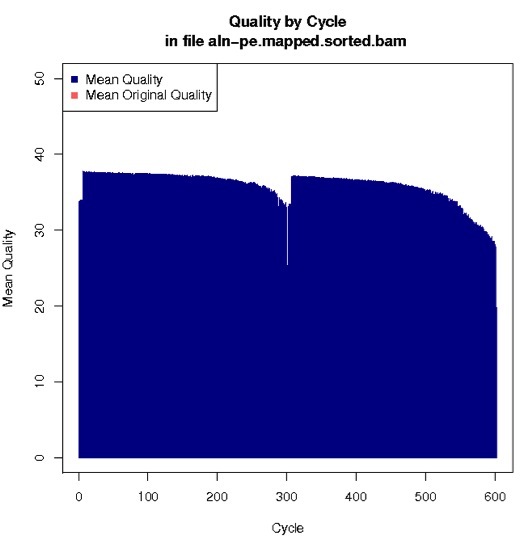 -stand_emit_conf 10.0 means dont report any potential SNPs with a quality below 10.0; but unless they meet the quality threshold set by -stand_call_conf (50.0, in this case), they will be listed as failing the quality filter. -dcov 500 means that any site that has more than 500x coverage, the genotype caller will only use 500 randomly selected reads for computational efficiency. Now, we check first few records of the generated VCF file. 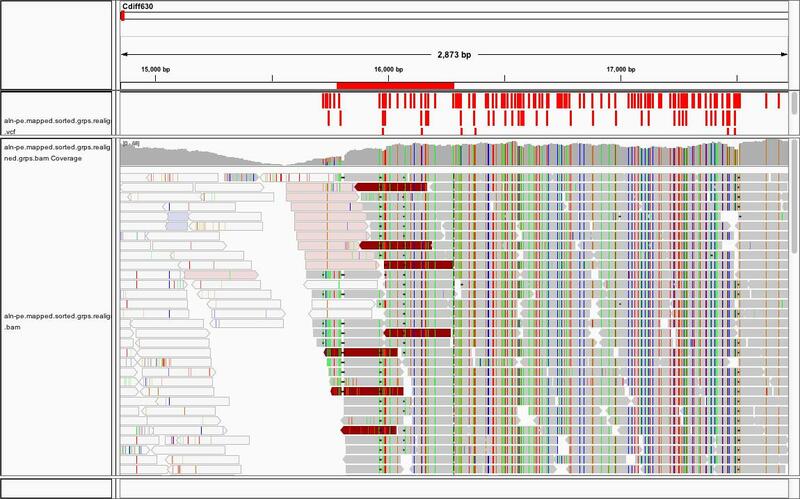 Finally, to view everything together, we can use Interactive Genome Viewer, which will require four files: ref.fa, aln-pe.mapped.sorted.grps.realigned.grps.vcf, aln-pe.mapped.sorted.grps.realigned.grps.bam, and aln-pe.mapped.sorted.grps.realigned.grps.bam.bai. In the figure above, the red rectangles on the top panel are the variants we found using our analysis, and the bottom panel shows aligned reads to the genome region along with coverage information. To validate assembly, we have used the paper Read Length and Repeat Resolution: Exploring Prokaryote Genomes Using Next-Generation Sequencing Technologies. 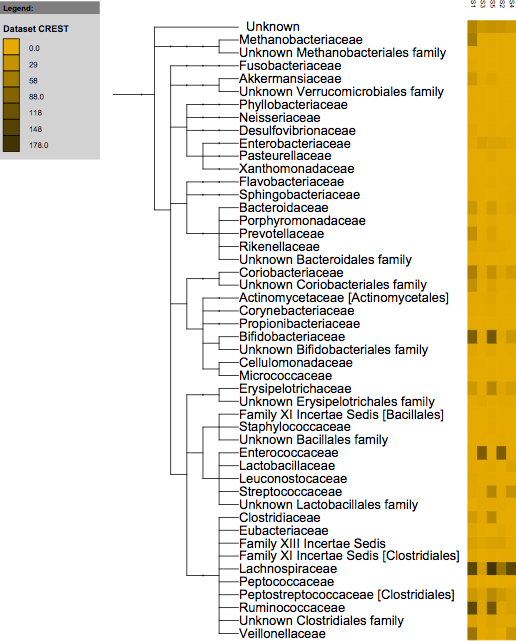 Table S1 from supplementary data is an excel sheet that gives read length and gap benchmarks for 818 bacterial genomes. From there, for the closely-related strain Nanoarchaeum equitans Kin4-M (genome length: 490885), with 125bp reads, 2 gaps are predicted, and with 250bp reads, 0 gaps are predicted in final assembly. It can be seen that with 50% of the reads, the longest contig 489315 is 99.68017% of the genome length of Nanoarchaeum equitans Kin4-M. And so the verdict is that: Yes SUBSAMPLING does improve assembly quality for very high coverage datasets when using Velvet without removing noise from reads. 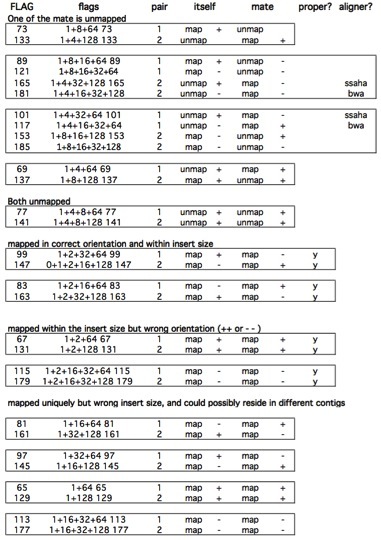 For each command given below, the first blastdbcmd invocation produces 2 entries per sequence (GI and title of the sequence), the awk command selects from the output of that command those sequences which have "16S" in their title and prints their GIs, and finally the second blastdbcmd invocation uses those GIs to print the sequence data for the 16S rRNA sequences in the nt database. Since nt database is huge, the methods given below use nohup to run the command in the background and they will continue even if you log off from a remote SSH session. [uzi@quince-srv2 ~/oneliners]$ mysql --user=root bioseqdb -e "show tables"
Last Updated by Dr Umer Zeeshan Ijaz on 13/04/2014.